The days are getting warmer here in Maine, the sun is shining a bit longer each day, and the snow is starting to melt. That means that two of a Mainer's favorite seasons are starting; mud season and maple syrup season. 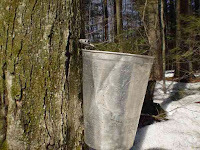 My friend Gardner Waldeier AKA Bus Huxley on YouTube collects maple sap to make maple syrup. He does it the old fashioned way and he made a video about the process. Gardner's video shows viewers how he collects maple sap and turns it into maple syrup. In the video explains why maple sap is collected at this time of year, how much sap he'll collect from a large tree, and just how much sap it takes to make a gallon of maple syrup. You also get a nice tour of Gardner's woodlot and plenty of images of his helpful dog. I don't think that Gardner deliberately edited the video to have the ideal length and pacing for a flipped classroom lesson, but that's how it turned out. Try EDpuzzle or Vizia to make a flipped lesson with Making Maple Syrup by Bus Huxley.